THE YEAR WAS 1989. OUR FOUNDER, GEORGE DEARRINGER, was operating a turf business supplemented in the cold winter months by interiorscape work. He found himself unimpressed with the selection of indoor planters available. Worse still was the amount of time it took to get these containers delivered once he made a purchase. It was then that George decided to focus his time and efforts to start a distribution company that sold exclusively to indoor landscapers...and NewPro was born. The original idea was to create a company that offered a wide selection of interior plantscaping products with a large in-stock inventory to ensure fast shipping. Over the years, NewPro has evolved. In addition to offering the best selection of indoor planters, fast delivery times, and superb customer service, NewPro has expanded its offerings to include all plantscaping professional by picking up several lines of large outdoor plant containers. We believe that prompt delivery plays an important role in our customer's business. Because of our belief, here at NewPro, great care is taken to ensure that orders placed before 12PM ET ship same day. By inventorying more than 95% of what we sell, NewPro is able to provide you the plant products you need when you need them. 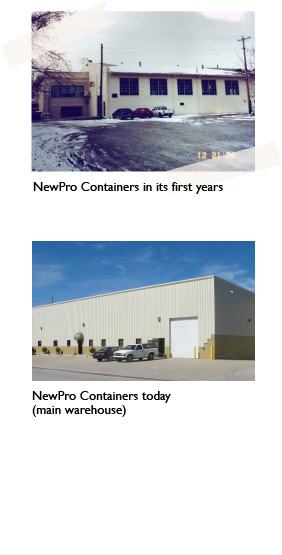 NewPro Containers is a family owned and operated manufacturer, importer, and wholesale distributor of commercial grade plant containers and supplies. In 2018, NewPro re-located two facilities in Zionsville to a brand new office and warehouse, just minutes north of Indianapolis in Westfield, Indiana.